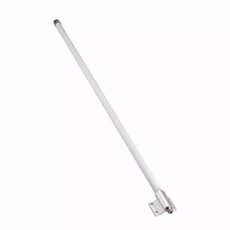 The 915MHz Barracuda ISM Outdoor antenna is designed to a have a long distance coverage. Omni-directional high gain across all bands ensures constant reception and transmission. The UV resistant coating with fiberglass housing makes this antenna suitable to be mounted in robust outdoor environment, pole-mounting and wall-mounting bracket is included. The antenna finds its usage in metering, industrial monitoring and security applications.